You read stories about it, but think it will never happen to you. Until you come home one day to discover your favorite shoes with bite marks on them – or worse, in pieces on the floor. Surely, you walked into the wrong house because sweet little Benji wouldn’t dare destroy something so important to you, would he? He would, and he did, because chewing to him is just a part of life. Read on to learn the science behind the behavior and how to avoid this disaster again! Dogs are like babies in a sense, they explore their world by putting things in their mouths. An easy way to understand this behavior is to remember that dogs don’t have hands like we humans do. Instead, they use their mouths. 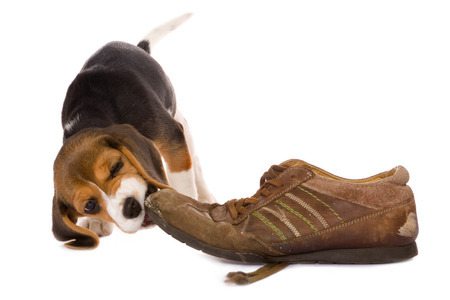 Your pup wasn’t trying to eat your shoe, he was only feeling and exploring it. For some dogs, chewing is a coping mechanism to help them deal with their stress and anxiety. Kind of like how you bite your fingernails or eat junk food when you’re stressed. If you suspect your dog is highly emotional or anxious, you may want to talk to your vet. The big thing to keep in mind is that you should be aware of your dog’s behavior and prepared. Even if your dog doesn’t have a history of chewing, you can never be too careful- especially when it comes to the holiday season when you have Christmas lights and other dangerous items out. Provide dog toys and other safe options for your dog to chew on. Observe your dog to see if he or she needs a toy he can tear into or one that will hold up to all of his energy. Remember punishing your dog won’t fix the behavior. If it continues to be a problem, talk to your veterinarian. If you’re considering getting a new puppy, don’t let the thought of their chewing discourage you. Instead, be prepared and purchase a toy breed pup from Pauley’s Pups! Give us a call today at 804-798-7877 today with any questions you have.